Elegant Event Lighting had the pleasure of working with Christi and Taylor Lally on August 27th, 2016 at the Eaglewood Resort and Spa in Itasca with a highlight of a “floating cake” after the ceremony. Our team suspended the cake inside a sheer champagne canopy accented with beautiful floral from Elizabeth Wray Design. The cake was illuminated with pin beam lighting and placed on a seemless white vinyl dance floor. The legs of the structure illuminated the flowing greenery and flowers. 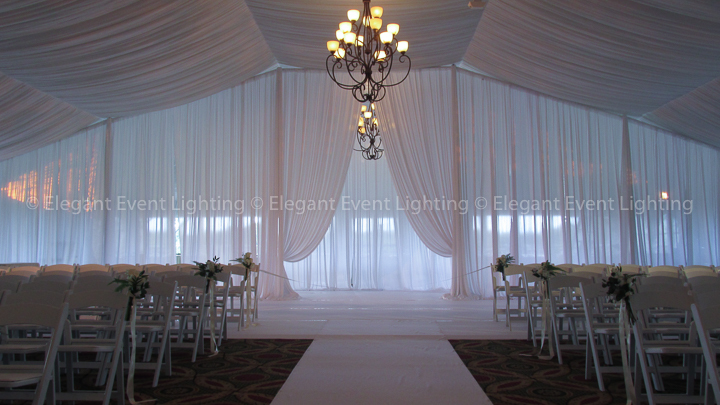 As Christi entered the aisle for her magical moment, a temporary white backdrop was placed to hide tables and draw full attention to the stunning wedding party. 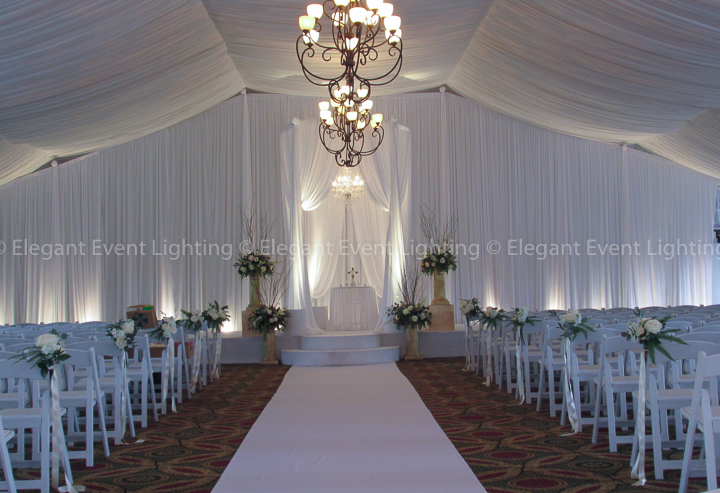 White uplighting was in place to shine upon the draped backdrop with a ceremonial canopy placed on top of a white stage as the couple stood beneath a twinkling chandelier. 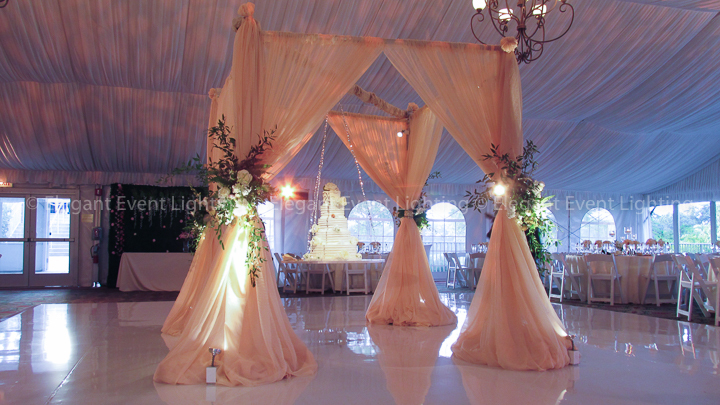 This was accented by an aisle runner up to two moon steps, all wrapped with white fabric. As guests danced the night away they were underneath the romantic amber leaf patterned lighting on the ceilings of the Eaglewood tent. 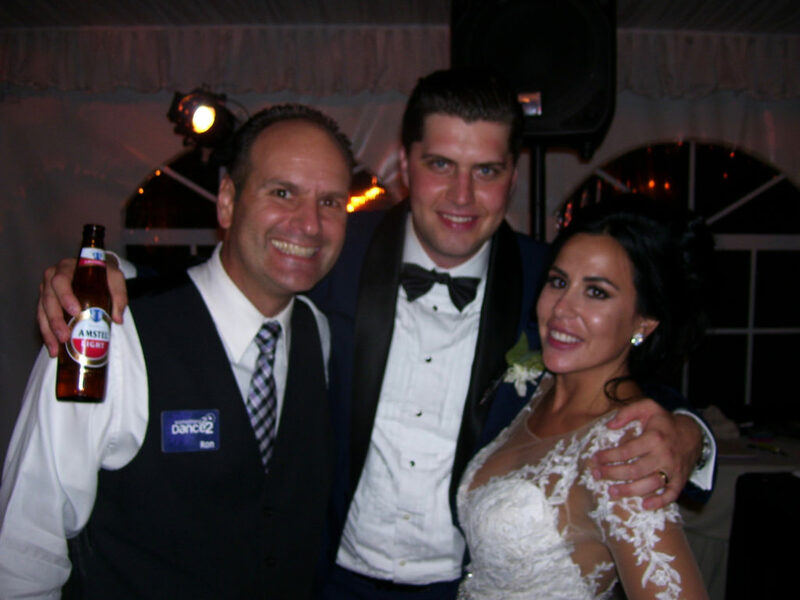 Our sister company Something 2 Dance 2 with DJ Ron presided as their wedding DJ and had the guests dancing all night long! The EEL Chicago team thanks Christi and Taylor for welcoming us into their special moment and providing the “wow” factor of such an elegant cake display following their ceremony!